There are very few public meeting spaces in Oslo which are shielded from the weather, most outdoor public spaces are used for a very short time in Spring, Summer and the beginning of Autumn. The Grønneriet would allow this period to extend in to Winter, guaranteeing a public space in Oslo centre for everyone all year round. The project offers a long needed green lung in an area where asphalt, stone and building mass have for so long dominated. 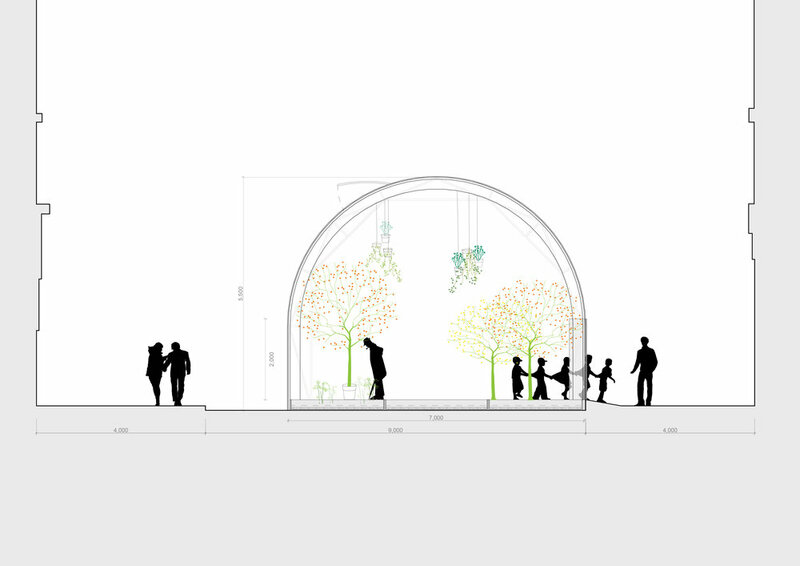 Grønneriet ( the Greenery ) is a proposal for an indoor park built in Oslo City Centre. The Grønneriet is an urban tree nursery, glasshouse and meeting place in Kvadraturen, the planned car free area in central Oslo.It is designed as a flexible construction which can be adapted to different situations and houses a protected micro climate where people can meet in green surroundings. It is a sociable and educational meeting place available for everyone, irrespective of age, status or nationality. It is imagined as a place to wander through, sit down, and enjoy the large space now available for everyone which was before only used by private car users. As a part of the project resource and cooperative groups are established with the local governement, schools, the university, senior centres and other relevant organisations. The Grønneriet is easy to manage because it builds on existing knowledge already available amoung engaged citizens. To cut the cost and construction time a standardised and accepted strucutre normally used in the agriculture sector can be ordered from a number of Nordic producers. The construction consists of a repetitve system in galvanised steel, covered by transparent corrugated plastic. Planting beds made in timber filled with soil are the stabilising element, anchoring the structure. The whole system allows for quick transport and mounting at a reduced budget.